We’ve enabled the member portal space this gives users a nice clean area to be able to “Discover Organizations” on the platform, “See Upcoming Events and Birthdays” and learn more about Memberz.Org in general. We’ll continue to update that space every month with new features and functionality so stay tuned for more. 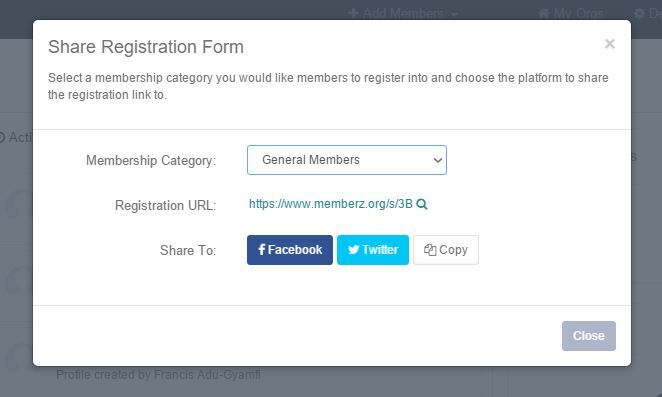 You can now share registration forms to Facebook and Twitter directly to get members to quick register to join your organization. Members can also create their personal accounts after registration so you can communicate with them via the platform. Members who have accounts on the platform will show a Blue Tick by their names on various screens. 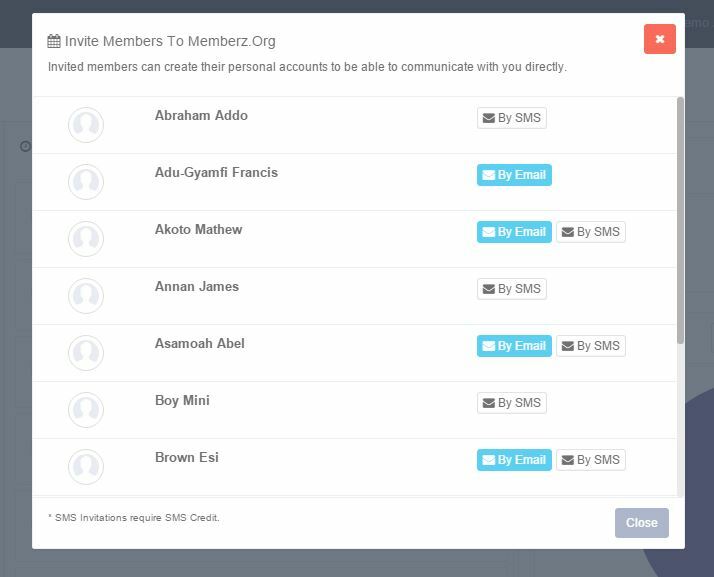 You can now invite existing members in your database to join you on Memberz.Org to also benefit from the new wave of membership management. When member join the platform, they can now see upcoming events you choose to share as well as birthdays of other members on the platform. Members will also be able to view the history of contributions they have made to your organization and in the near future be able to contribute via the platform as well. Invitations via email are free, however, invitations via SMS will require you to have credit on your account. You can now enable a new feature, Send SMS Receipts under the “Finances -> Settings” area. 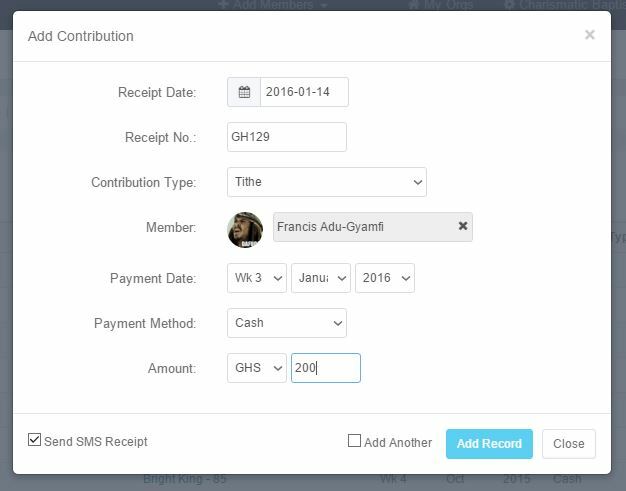 When enabled, you can choose to send an entry receipt via SMS to a member when you record a ‘Member Specific’ contribution, i.e. contributions tied directly to a member. This is a great tool to enable your members feel confident about their administration and encourage them to contribute more often, since it offers greater transparency in the contributions process. SMS messages sent will show up in the history area for Instant Messages. Please note: SMS Receipts require credit on your account to be able to send messages. We’ve added the first phase of our events management feature. With this functionality, you will be able to create and share information about upcoming events in your organization. With the events management dashboard, you can create multiple calendars and add events to each. Events in a particular calendar show in distinct colors which are configurable. There is also a default “Birthdays” calendar than when enabled, will display all upcoming birthdays in the calendar area. Events you create will show up in the member portal and in the events specific area of the member portal. In the near future, we’ll enable functionality for members to join paid events and purchase tickets online. Stay tuned for those features. Blue Ticks: When viewing member databases, members with accounts on the platform will be displayed with a blue tick next to their name. So sign up today and be one of the first to try the new features out. Think we are doing a good job or making a mess of things? Let us know in the comments below.